When I came back from my CZT training in Providence, RI I had a mess of papers to keep track of. I didn't want to punch all of them and keep them in a binder so I headed down to Office Depot to find something suitable to contain all of my new found goodies. As I was walking down the aisle I spotted this. The second I saw it I thought, "That looks just like a Zentangle!" It was a steal at $.99 so I grabbed one. In retrospect I wish I had grabbed about 10 because it has come in very handy. I used it for about a month, each time noticing something different about it. It has many flowers and even has some designs that are almost identical to Beadlines, Fescu and something that reminds me of Mooka not to mention it is black and white so it has a true Zentangle feel. So one day while working at my desk I spot this little gem in the bottom left corner of the bottle. I knew instantly it was my next new tangle. I practiced a little on a piece of scrap paper and then left it alone. I came back to it a few hours later and liked it even more. I decided to sketch out the steps but it still needed a name. Most of my tangles "speak" to me pretty early on and I don't have to search to far for a name but this one didn't speak to me at all. My phone was nearby so I snapped a quick pic and sent it off to a few friends asking "What should I call this?" My friend Greg wanted to call it something like "beautiful blossom". I love you Greg, but no. Instead of helping me out, my friend Margarito sent me a picture of a rooster he had bought and asked me to name it instead. My friend Andrea said it should be called "the start of your first tattoo!" Cute, but no, not yet at least. A few minutes later my friend Chris chimed in with Pistil. I called her and said "Do you mean pistil, as in the pistil of a flower?" At which point she said "Yes, like a flower! You know, like in the song from Grease." As soon as she said it I knew what I was in for. She sang the whole song to me, while our poor friend Jenn endured what I am sure was about 3 full minutes of confusion and embarrassment. But hey, she has a pretty good voice and I know Chris well enough to know that there was probably some dancing involved so all in all I'm sure it was a pretty good show. So it was decided, pistil it would be but in true Zentangle fashion I had to change it up a bit. Here is the finished product. I hope you enjoy. I have just discovered Zentangle ..... bought my supplies and just need to find time to sit down and tangle!!!! Thanks for stopping by my blog. 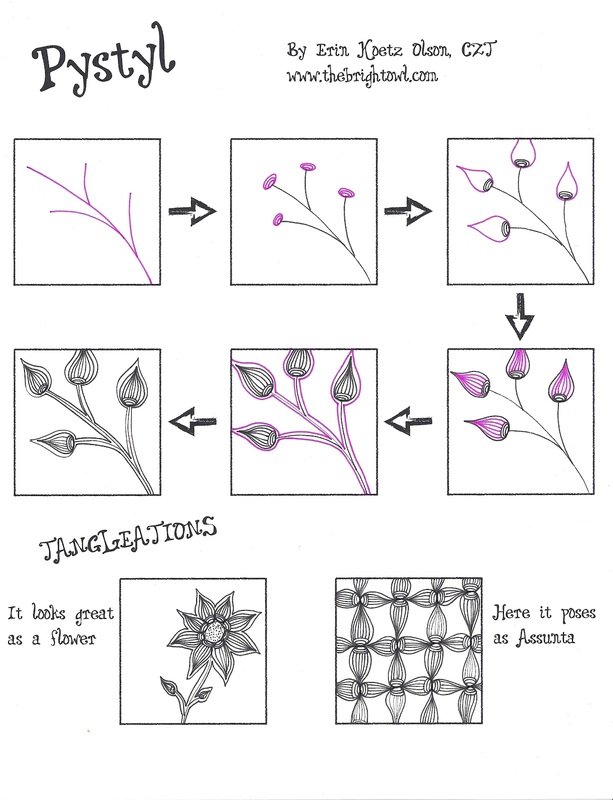 You will love Zentangle! Check out the links on my blog, there is some great inspiration. Great Post on Zentangle Inspiration. I see patterns everywhere I go. I found some black and white folders that had doodles on them with some pretty cool designs resembling zentangle. 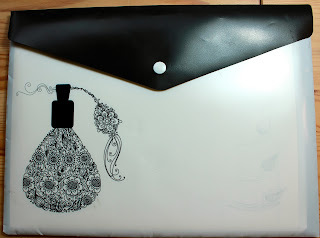 The bottle shape on this folder gives me an idea for a swap, zentangle vintage perfume bottle shapes? I'll have to recommend this to those at ZIA group. 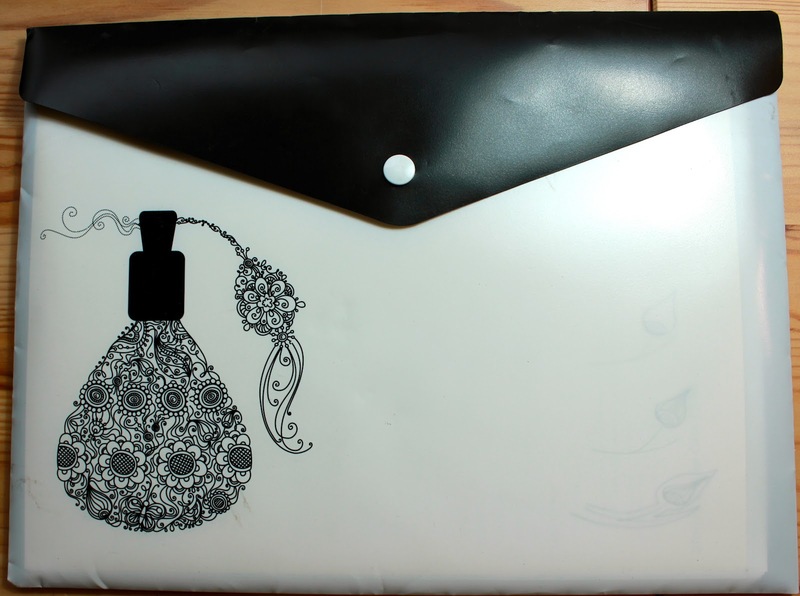 Thanks for your post and the new Zentangle, Pystyl, it is fantastic! Carol, thanks for your kind words. I'm glad you like Pystyl. It lends itself to a lot of tangleations and is really fun to do. Pystyl is a gem, love the story, thanks!